The Spotlight Mid Wales 'Inspiring Success' conference was sponsored by the Welsh Government. It was held in Newtown, Powys. Just been sent some very nice photos from the East Midlands Landlord Expo. See earlier post for details about the event. Radisson Blu Hotel, Cardiff, on 1st May at 7pm. The Noah’s Ark Night of Champions is the official launch of Paralymian Gold Medalist David's ‘Extreme Triathlon’ in aid of Noah’s Ark Children’s Hospital Charity. 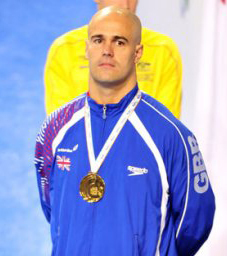 Guests of David's include: Aled Davies MBE, Mark Colbourne MBE, John Harris - and me! The event includes a drinks reception, three-course meal, 'a speech by Kevin Green', auction and Question and Answer session with the Paralympians. 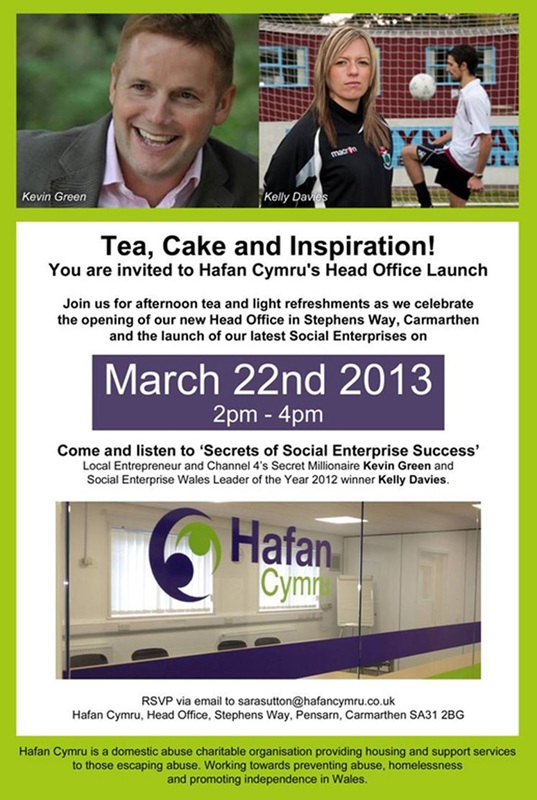 Really enjoyed the Hafan Cymru office launch in St Stephens Way, Carmarthen, on Friday. The Mayor of Carmarthen, Councillor Phil Grice, was also in attendance. Looking forward to this afternoon, when I will be helping the Hafan Cymru charity launch their new offices in Stephens Way in Carmarthen. The focus of the event is to highlight the potential of social enterprise and the opportunities it can offer Hafan Cymru's current and ex-service users and a number of other beneficiaries. The hope is to encourage service users to help themselves to becoming more independent, be inspired in looking at social enterprise opportunities and to develop themselves. I'll be one of the speakers, along with Kelly Davies, winner of the Social Enterprise Leader of the Year 2012. Hafan Cymru is a charitable organisation operating across Wales, providing housing and support services to women, men and their children, particularly those escaping Domestic Abuse. We also deliver a very successful project called ‘Spectrum’ visiting schools and educating the youth of Wales about abuse and it’s consequences.Since its inception in 1989, Hafan Cymru, (formerly known as Cymdeithas Tai Hafan) has grown from strength to strength, and currently has over 140 staff delivering support services across 17 of the 22 Local Authorities in Wales. We offer a complete package of support provision to help people with a wide range of needs, often complex or multiple needs – including those who have experienced physical, sexual or psychological abuse; those recovering their mental health; ex-offenders; substance misusers; care leavers. We encourage and enable staff and service users to actively participate via regular consultation, this regular feedback and input maintains high standards and is key to our innovative approach to service development. You obviously have to welcome the help schemes targeted at getting the housing market moving. The shared equity scheme and guarantees on new lending are very good news. The man in the street will be pleased at the £10,000 threshold and there’s good news for businesses on corporation tax. But my biggest worry is the way the Chancellor was talking about changes to welfare and benefit payments in June. He didn’t really elaborate and that must be a headache to landlords like myself. In short, many landlords will be thinking whether they should take on benefit claimants as tenants. The lack of clarity in the Chancellor’s statement will leave landlords worried. We need more detail and we need it now, not in June, as the uncertainty will not be good for the rental housing sector. Kevin is a self-made multi-millionaire and social entrepreneur. He is one of the UK’s largest residential property landlords and a multi-business owner. It was great to be at the East Midlands Landlord Expo today. Great to meet so many enthusiastic and enterprising business-people. Enjoyed giving my keynote address and received some great feedback. About the East Midlands Landlord Association. Our purpose is simple. We want to provide landlords, with the advice, tools and knowledge they need to be professional, and we want tenants to have decent, safe and affordable homes in a thriving and safe community. As a professional landlords association it is our job to help housing professionals like you to manage and comply with all housing legislation and regulation necessary to be a good landlord. EMPO was formed in 1942 and throughout this time our mission of being dedicated to raising the profile of responsible landlords and to encourage the improvement of standards has remained constant and true. EMPO is a not-for-profit association. This means that the money we make is put back into the association and funds the activities we carry out to support our members and landlords within the wider community. We work closely in partnership with our members who control and manage in excess of 15,000 properties across the East Midlands. There's a big debate raging about the Government's proposed welfare reforms. I'm very concerned about how the landlord-tenant relationship will stand up to the changes. Here is a press release produced by my team . . .
Social entrepreneur Kevin Green has warned that the Government’s Universal Credit welfare reforms are a “disaster waiting to happen”. Green, who is one of the UK’s largest private sector landlords, has said the Government should be ringing “alarm bells” following the results of a South Wales trial of benefit reforms. The trial in Torfaen saw rent arrears from tenants in the area rise seven-fold to £140,000 in seven months. The planned Government changes mean that housing benefit (previously paid directly to landlords) will now be transferred to claimants. The Government has said that the change will help claimants manage their finances better. But landlords in the pilot area in Torfaen have warned that evictions could increase if the trend in the trial area continues after the system for paying benefits is fully adopted. Millionaire entrepreneur Green, 49, runs a massive portfolio of private rental properties from his South Wales base. “Like hundreds of other landlords out there, I operate with a high degree of social responsibility. “It is in everyone’s interests that there is a good landlord-tenant relationship built on mutual trust and respect. “It is stating the obvious that some of our tenants on lower incomes find it very hard to manage their budgets. When payments are made directly to landlords, problems can be eased. “But when the system changes fully to payments made directly to claimants then we have a disaster waiting to happen. “It is only right and proper that we should start ringing alarm bells after this trial in Torfaen. Sadly, it shows that our worst fears are coming true with an increase in rent arrears. “No-one likes evictions, but many landlords will be pushed into making harsh decisions if rental payments don’t come through on a regular basis. Sadly, for the taxpayer, the result of any evictions puts further pressure on housing and social services – more pressure and more expense for the public purse. “I have been warning about the problems in these Government changes since they were announced. The problems in Torfaen seem to back up my worst fears. Torfaen is one of six areas where the Department of Work and Pensions is running what it calls "demonstration projects" ahead of the introduction of the UK government’s flagship welfare reform of Universal Credit in the autumn. The problems in Torfaen have already been highlighted by the BBC’s Eye on Wales radio programme. Under the reforms, claimants' benefits will be rolled into one credit paid directly to their bank account on a monthly basis. Housing benefit will become part of the Universal Credit, signalling an end to the current system where payments are made straight to local councils or housing associations, reducing the risk of the 100,000 social housing tenants in Wales falling into arrears. Chief executive Duncan Forbes described the rise in arrears to almost £140,000 as "significant", adding that a large proportion of the tenants were "never in rent arrears before". "That was a group of people who had a good track record of payment and pretty low level of arrears, thrust into a position where they are now is significant arrears," said Mr Forbes. Steve Clarke, managing director of Welsh Tenants Federation, told Eye on Wales that direct payments were a major cause of concern. Similar concerns have been voiced by a Commons select committee which last November warned the Department of Work and Pensions not to rush into launching Universal Credit. Pic of Kevin Green available. Latest news on the Bank of Ireland row (see earlier post). It is understood that some of the customers affected are prepared to take their case to the Financial Ombudsman Service after Bank of Ireland turned down a complaint that it had breached legislation on unfair terms and contracts. A number of Bank of Ireland customers affected by the recent increase to tracker mortgages have been offered £1,000 to leave the bank. Andrew Tyrie, the chairman of the Treasury Select Committee (TSC), has written to the Financial Services Authority (FSA) over a decision by the Bank of Ireland (BoI) to raise mortgage interest rates. In his letter, Tyrie said he was "very concerned" by the move and queried whether it could be deemed a case of product mis-selling. He has also asked whether it will be taking a closer look at the clauses within the affected contracts. The ladies at the A Passion for Homes website (see earlier posts) have just posted a video of their launch party. I was the guest speaker at the launch at a swish location in the shadow of The Shard in London. I can give away a secret about the launch: it isn't tea in the lovely china cups, but champagne and elderflower sparkling wine! Using video to ensure the launch of A Passion for Homes in February was caught on film, including an interview with TV presenter and A Place in the Sun presenter Laura Hamilton, was an important aspect for this new company. Offering their services for this important element of the launch day was Sian from the Metcalfe Partnership, including Pure Motion Productions, who are known for producing video tours for estate agents selling properties, including Red Kite Homes, Kemp and Co and Pure Properties. A Passion for Homes is also a marketing agency. Jo and Andrea offer companies within the property and home industry specialist and targeted marketing and social media services and training, as well as opportunities to appear on the new website. The launch of A Passion for Homes was on Thursday 14th February at a converted Victorian warehouse, now a private residence, in the Tower Bridge area of London, for sale with Chesterton Humberts. One of the UK’s largest private sector landlords has welcomed the growing clamour for financial regulators to investigate the Bank of Ireland’s plan to raise customers’ mortgage tracker rates. “This is the sort of activity which really gives banks a bad name,” said multi-millionaire and social entrepreneur Kevin Green. Green runs a massive portfolio of private rentals properties from his South Wales base and sources investment funds from a wide variety of locations. “In these austere times, and with all that has happened in the banking world, you would think that the banks would be keener than ever to demonstrate that they are operating on a fair and level playing field,” said 49-year-old Green. The chairman of the Parliamentary Treasury has written to financial regulators asking them to investigate. In a letter to the Financial Services Authority, Andrew Tyrie said he was “very concerned” and asks if it was a case of product mis-selling. Despite the Bank of England base rate remaining at 0.5%, Bank of Ireland is more than doubling its tracker rate. The Bank of Ireland, which owns Bristol and West, has, so far, offered no comment on the move. About 13,500 mortgage borrowers with Bank of Ireland and Bristol and West will see the cost of their home loans rise. It has the power to change the interest on these home loans, even if the Bank rate does not move. But mortgage brokers have criticised the move. The Bank of Ireland has blamed the rising cost of providing these mortgages and new rules on the amount of capital it must hold in reserve. Banks must hold a higher buffer of capital to a certain level in order to keep to European rules. From 1 May, the bank will raise the mortgage rate for residential customers from, typically, the Bank of England rate plus 1.75%, to the Bank rate plus 2.49%. It will then raise it further, to Bank rate plus 3.99%, on 1 October. Buy-to-let customers will see their rate increased to Bank rate plus 4.49% on 1 May. Mr Green said: “This alarming and cavalier move by the Bank of Ireland has a direct impact of two of my contracts. “As far as I am concerned (and believe you me, as a seasoned landlord and property investor I have plenty of experience of these matters), the ‘differential’ clause being invoked by the Bank of Ireland was unclear to me as a customer when I took out buy to let mortgages with them. “Under Financial Services Authority (FSA) guidelines, this may be deemed to be outside of the rules of lending as the FSA quite clearly states that customers must be made aware of all clauses in a mortgage offer, with a clear explanation. Last week, Andrew Montlake, of mortgage broker Coreco, said: “This is a shocking move by the Bank of Ireland and, it could be argued, shows a blatant disregard for the fortunes of their customers. One of our clients has been hit with a sudden rise of 2.74% on a rental property that was ticking along nicely, which increases payments by £776 per month. Enjoyed being interviewed by Matt Faulkner of BBC Radio Somerset this morning. It was all about the work of the Make A Wish Foundation. I help the charity as an ambassador. Listen again on the link. It's in two-parts on Audioboo. Great day helping to judge the Welsh Government's Global Enterprise Challenge event in Cardiff today. There were some great presentations by all the youngsters. The winners were Pembrokeshire College. Congrats go to the team from the west! Many thanks to all who attended the weekend wealth seminar in Reading. It was great fun and wonderful to meet so many people passionate about making a success in business. Thanks go to all for their contributions to the Make A Wish Foundation. We raised a magnificent £750.